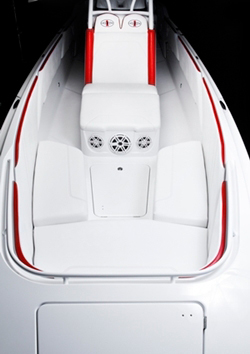 This new center-console presents a bold departure for the iconic builder of custom V-bottoms. 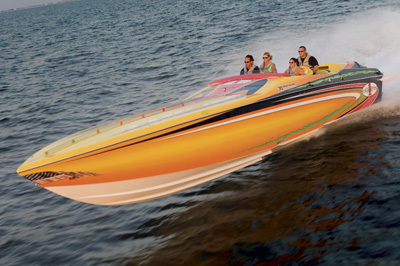 A lot of people don’t know this, but one of the first boats that Don Aronow (founder of Cigarette, Donzi, Magnum, and a slew of other high-performance powerboat brands) ever built was a center-console. 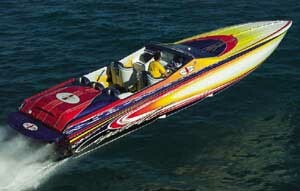 That was nearly 40 years ago, and Cigarette Racing Team, the most successful company he established, is still going strong. 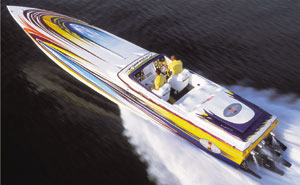 The 39’ Top Gun Open rides on the same hulls at the original 39’ Top Gun. What a difference 40 years makes… sort of. 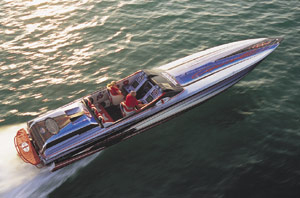 As of the introduction of the 39’ Top Gun Open at the 2011 Fort Lauderdale International Boat Show, Cigarette now has not one but two center-consoles in its line-up. The first was the 39’ Top Fish. 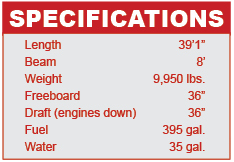 Aside from their center-console format and V-hulls, the two offerings couldn’t be more different. The 39’ Top Fish has a 10-foot beam, rocket-launcher rod holders on its T-top, inset rod holders in its gunwales, rod racks, fish boxes, an optional live well, and is offered with cuddy cabin and open interior layouts. The 39’ Top Gun Open, with its 8-foot beam—well, it has none of that stuff. 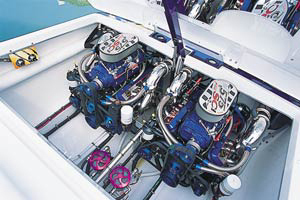 “You won’t find a rod holder or a fish box on this boat,” says Skip Braver, owner and chief executive officer of the Opa-Locka, Fla., custom go-fast boat company. 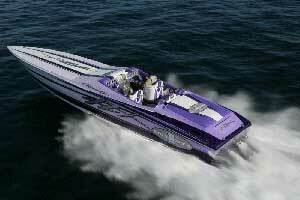 “People who want to go fishing can buy our 39’ Top Fish. 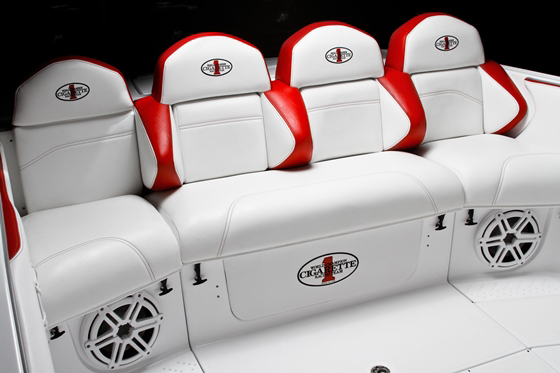 The 39’ Top Gun Open is a true performance center console with incredible seating done in new double-stitched upholstery, a mind-blowing JL Pure audio system, an all-new T-top, and a whole lot more. The rear section of the cockpit features a four-person bolster-bench. 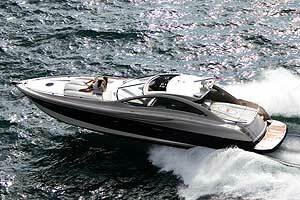 The bow interior of the 39’ Top Gun Open is all about space and seating for passengers. 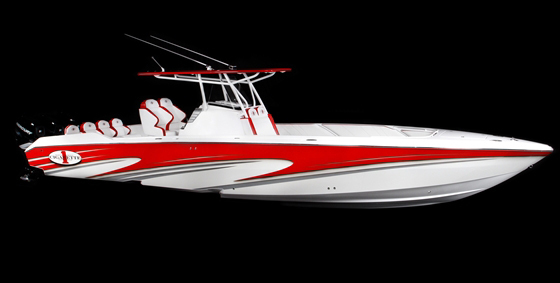 In addition to an all-new T-top designed and built for the new offering, the 39’ Top Gun Open, which rides on a proven two-step hull, has extensive “bling” in the form of bountiful billet hardware and new deck hatches. High-back bolsters with drop-out bottoms are provided for the driver and copilot. Additional seating includes what could safely be described as a “giant” U-shaped lounge forward of the console, which is outfitted with a complete head locker, and a slick four-person bolster bench in the rear of the cockpit. One of the seats even swings out for easy boarding and debarking from the transom. 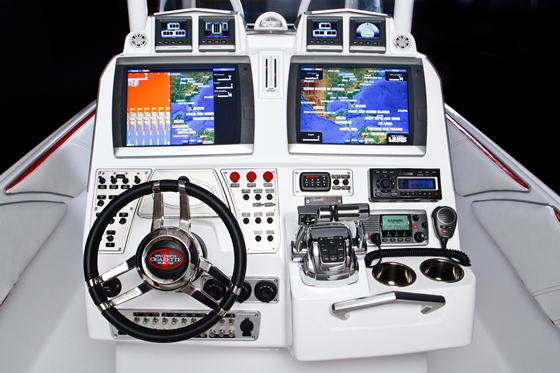 The model unveiled during in Fort Lauderdale boasted a Garmin “glass cockpit” with the Garmin 5200 Series GPS system, two 15” screens, and four GSI-10 instruments. The Garmin set-up interfaces with the engines’ digital read-out to provide real-time feedback on operation and navigation. Pricing for the new model has not been disclosed yet.